Since the consumer marketplace shifted to the World Wide Web, many brands focus on digital marketing campaigns to reach the new media-obsessed audience. Printed media appears to be slowly transitioning to an online-only existence as we see more newspapers tossed in recycling bins and electronic tablets in consumer hands. It’s easy to see this trend and wager that the impact of print advertisement is on the decline. However, print materials should not to be disregarded. If used in collaboration with digital marketing, they can make a bigger impact than ever before. They can, in fact, direct consumer traffic to webpages, bring consumers to the virtual checkout line with coupons, and foster a consumer-brand bonding experience. Maybe you’ve seen a print advertisement in a public venue, or in a magazine and noticed that square grid with the pixelated, black dots on a white background. It’s called a QR code (Quick Response Code), and with the help of smartphones, people can scan the code like a barcode and it will direct them to a specific webpage. 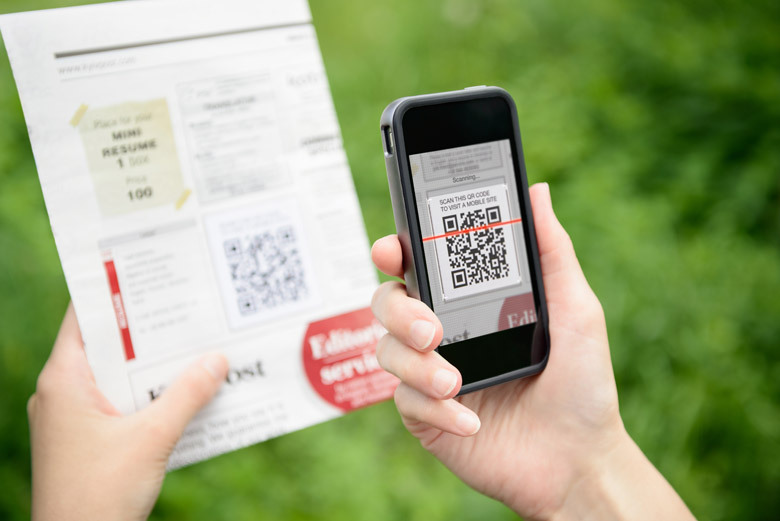 QR codes literally place instant real-time information into the hands of consumers. The webpage may reward the curious visitor with a special offer, provide more information, or allow the visitor to purchase a product. QR codes can also direct traffic to social media pages, ultimately recruiting more followers. Some companies use QR codes to connect with consumers by offering something the consumer is likely to take advantage of. For example, a product might encourage consumers to scan the QR code for a free music download, and at some point during the download process, the consumer will be exposed to the advertising information the product wanted them to see. QR codes also leverage the opportunity to pique consumer interest through curiosity. If a consumer sees a code next to a question, they might be tempted to scan it to discover the answer. Continuing its long-term a partnership with Coca-Cola, each year, Universal Parks and Resorts offers discounted admission to Halloween Horror Nights through printed coupon codes on specially marked Coca-Cola products. This is an example of how brands can leverage their products to help promote one another, but even more so, how printed goods can prompt digital sales. Even if you’re brand is newer in the marketplace, you can easily print coupon codes on printed cards that will encourage online engagement. Consistency is a key component in the collaboration of print and digital so that the consumer can continuously recognize your brand from paper to touch screen. Make sure your web page matches what the consumer expects so they do not feel misdirected. Most importantly, do not promise what you will not deliver. If your call to action says to scan for a free product sample, actually give the consumer a free product sample. Don’t take them through a maze of advertisements and information irrelevant to the product of interest. Don’t ask for an unrealistic investment in your product, such as a costly year-long subscription, in exchange. If you do either of these things, it is likely consumers will feel cheated. It will compromise your brand’s trust. When consumers see your offer next to a code again, they will think twice before following it into the digital realm, forecasting it a waste of time. Print and digital best work together when the physical paper-in-hand initiates online engagement because, online, there is more possibility for quick, easy consumer-product interaction. If you provide offers that follow through as a pleasing interactive experience for consumers, they will think positively of your brand and return. The more consumers that return, the more your brand will become a part of their lives, achieving the significance most brands hope for.